Bastar, April 11: The parliamentary constituency of Bastar, affected by left-wing extremism, is being contested today in the phase 1 of Lok Sabha elections 2019. Voting began at 7am and continued till 3pm at polling booths marked as "hyper-sensitive", whereas, the electorate registered at low-risk booths will be allowed to cast their mandate till 5pm. The final voter turnout in Bastar is 66 per cent, Election Commission officials confirmed. Chhattisgarh Lok Sabha Elections 2019 Schedule: Constituency-Wise Dates Of Voting And Results For General Elections. A total of seven candidates are in fray, with the primary contest wedged between BJP's district unit chief Baiduram Kashayam against Congress' firebrand leader and Chitrakoot MLA Dipak Baij. In 2014, the seat was won by BJP MP Dinesh Kashyap. However, the party decided not to re-field him from the constituency. Bastar Lok Sabha Constituency in Chhattisgarh: Candidates, Current MP, Polling Date And Election Results 2019. The Bastar Lok Sabha seat consists of eight assembly segments. Voting time will be restricted, till 3pm, in four out of them - Dantewada, Konta, Bijapur and Narayanpur - due to the threat posed by naxal insurgents. In the remaining assembly segments - Bastar, Chitrakot, Kondagaon and Jagdalpur - voting will continue till 5pm. 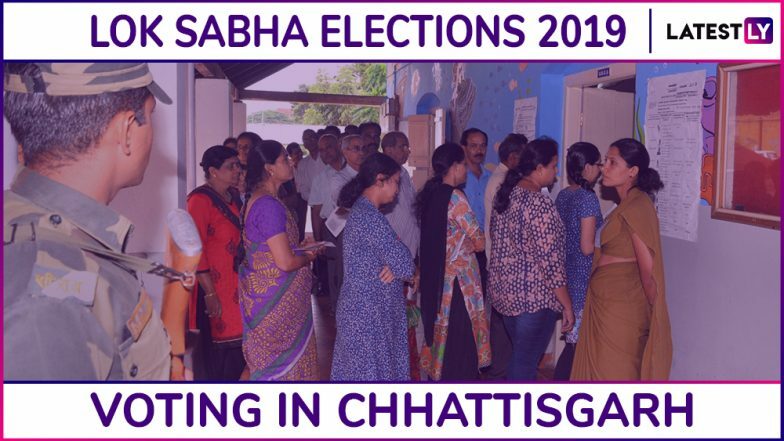 According to the Chhattisgarh Chief Electoral Office (CEO), a total of 1,879 polling booths have been earmarked for the smooth conduct of the elections. Out of them, 606 are being considered as sensitive and 741 as hyper-sensitive. 289 polling stations have been shifted from their erstwhile locations due to the threat posed by Maoists, said an official from the CEO. The total registered electoral size in Bastar is 13,72,127 voters -- out of whom, 6,59,824 are men, 7,12,261 women and 42 belonging to the third gender. Security has been escalated in Bastar in view of the fatal naxal attack in Dantewada district -- which comes under this parliamentary seat -- two days ago. The Election Commission has deployed nearly 80,000 security personnel, including those from the state police force and the CRPF to ensure free and fair elections.